Where can you find the largest collection of Torah scrolls? At the Western Wall in Jerusalem? No. At the Center for Jewish History in New York? Not there. The answer is the Iraq Museum in Baghdad. But don’t look for the exhibit. An exclusive investigation reveals 365 scrolls are deteriorating in a secret sub-terrain location. After several years of silence, an unlikely hero is going public with his first-hand knowledge about the hidden scrolls. It may be the last chance to save them. He’s called the Vicar of Baghdad. Andrew White is an Anglican priest risking his life helping Christians in Iraq. Even more dangerous, however, is what he volunteers to do – protecting the last few Iraqi Jews. Canon White juggles life in two very different worlds. In his hometown of London, he’s focused on his family; in Baghdad, he’s occupied with his congregation. In the UK, he dons a bright bow tie. In Iraq, he wears a sand-colored bulletproof vest. In London, he’s followed by two sons. In Baghdad, he’s flanked by bodyguards. In both worlds, Canon White is a promoter of Judaism. Another thing happened as a result of Saddam’s demise. Iraqi mobs looted his crown jewel of culture, the national museum. The majestic Iraq Museum is still on Nasir Street but it’s under new management – the elected Iraqi government. A museum director, Dr. Donny George, was appointed to restore the museum in 2005. Soon after, Canon White was invited for a private tour. Dr. George and Canon White strolled through the grand halls. Eventually the priest was led down to the basement level. Dr. George opened the heavy doors of a vault. Canon White couldn’t believe what he was looking it – rows and rows of Torah scrolls. “There are 365 of them,” declared Dr. George. Canon White’s surprise turned into horror. “The Torah scrolls were all at risk. Rats were eating some of the parchment. They were not properly preserved or displayed, just stacked up on the dirty floors,” he says. He asked Dr. George to get the scrolls off the ground to deter the rats. Whether this was done is not known. “The museum had no regard for the importance of the Torah scrolls,” he says. Canon White wanted to rescue them, but he decided to try to obtain just one. He had a destination in mind. “No, we can’t let you take any because we need to translate each one,” replied Dr. George. Canon White is not only concerned about the physical safety of the scrolls; he is also dedicated to what’s written on them. Yes, he does. Canon White learned the lingo as the first non-Jewish student at the Karlin yeshiva in Jerusalem. A rabbi there permitted him to get a taste of Jewish learning. He has grown from a student of Judaism into a teacher of it. He offers a weekly course about Judaism to Christians in Baghdad. “The Iraqi Christians who come to my class are shocked,” says Canon White. “They say that nobody has ever told them about Judaism before. It’s hard for them to accept that they’ve been told lies. Ignorance, as Canon White calls it, prompted him to write a book about the Jewish roots of Christianity. He shared the newly finished manuscript . It describes several fundamental concepts and practices of Torah observance. Canon White’s story about the scroll sounds credible but required investigation. A search for the former museum director, Donny George, was a dead end. “He died last year of a heart attack,” says Canon White. A second source was discovered. 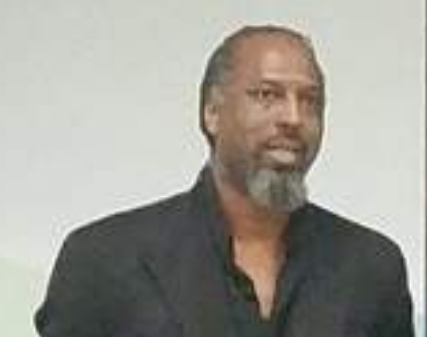 A former US embassy employee, who does not want to be named, recalled a conversation with Dr. George that occurred around the same time as Canon White’s museum visit. Dr. George told the embassy representative that approximately 300 scrolls were in the museum basement. The US State Department offers its own partial confirmation. “We are aware that the government of Iraq holds a number of Torah scrolls in the Iraqi National Museum,” says a spokesperson. He would not disclose how the fact came to be known. What happened to these scrolls? When even one Torah scroll leaves Iraq it makes news but no news stories were found about a large transfer of scrolls from the museum. The photo proves a large cache of scrolls did in fact exist. It is possible that they were returned to the basement vault where they are still sitting today. The Iraq Museum did not reply to emailed questions about the existence of the scrolls. However, the Iraq Embassy in Washington acknowledged scrolls are somewhere in the Iraq Museum. “I can’t confirm the number, whether it’s large or small,” a spokesperson says. However, the museum’s website does not disclose this fact. All of the museum’s collections appear to be catalogued on its website. Not one Torah scroll is listed. At issue are thorny legal and moral questions of rightful ownership. 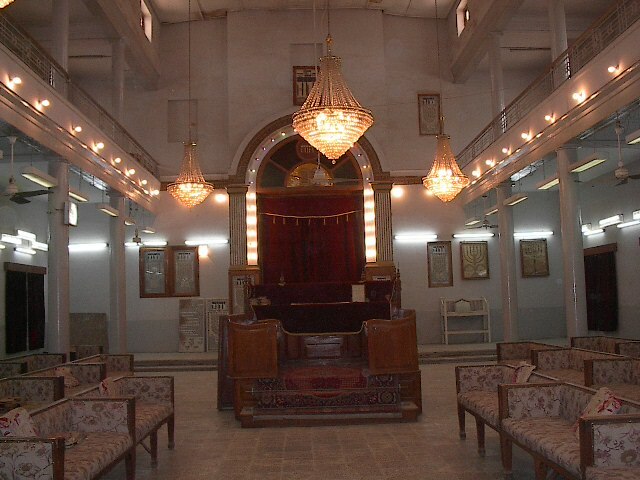 Iraq’s policy is not to relinquish Jewish artifacts, according to public statements by high-ranking Iraqi officials. “Jews lived in Iraq. They are part of Iraq’s cultural heritage,” says the spokesperson for the Iraq embassy in Washington, DC. Iraq’s rationale is undermined by the absence of Jewish artifacts on display in their museums. Even the museum’s written historical narratives omit Jewish references. The Iraqi Jewish community has a legitimate case for reclamation, say some experts. The scrolls were most likely confiscated during the purge of Iraqi Jews. A possible legal problem is that the Jewish community in Iraq – the original owner – no longer exists. Now 86, Eric Rouleau is one of those extraordinary figures that seems to transcend the Jewish-Arab divide. An exceptionally well-respected and well-connected journalist for Le Monde and then French ambassador to Tunisia and Turkey, he is one of the few Jews to have been friendly with Nasser, whom he refused to brand as antisemitic. His memoir, summarised in this essay for the American University of Cairo, is fascinating because it is not often one hears of Rouleau's Cairo upbringing and expulsion from Egypt. And it is surprising that a man who joined the Communist party after WW2 once toyed with the idea of becoming a rabbi and briefly flirted with Zionism, albeit of the Hashomer Hatzair Marxist variety. Furthermore, the notable figures of the community, led by the chief rabbi, began to slowly become aware that the Palestine conflict could have serious consequences for Jews in a country where the majority of the population could only be hostile to the Zionist project. 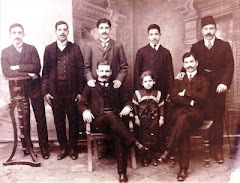 Thus their constant need to proclaim themselves loud and clear as “both Jews and patriotic Egyptians.” It was a declaration of faith that earned them the support and protection of the palace and the government and even the goodwill of the Muslim elite, before the escalation of the Judeo-Palestinian conflict. Egyptians naturally felt a unique sympathy toward Palestinians, their neighbors who had been stripped of a part of their territory by a minority of foreign colonialists. Interviewing Hassan El-Banna: Before his assassination on February 12, 1949, I had the opportunity to interview Hassan El-Banna for the Egyptian Gazette, an English-language daily newspaper where I worked as a journalist. The supreme leader of the Muslim Brotherhood had led the campaign against the creation of a Jewish state and provoked in me a feeling of indescribable anxiety. Stocky and wearing a loose red tunic for the occasion rather than a suit, his face framed by a messy black necklace of a beard, he received his guest with a clerical smoothness, staring at him with a piercing gaze. He was clearly trying to seduce his interlocutor using a playful sort of cunning as well as flowery language and well-structured analyses supported with a host of quotes and apparently inexhaustible anecdotes. He seemed indifferent to the fact that I was Jewish. A brilliant and passionate orator, his demagoguery, with its prophetic overtones, made large crowds go wild with enthusiasm. He believed that only Islam could cure the ills that the people suffered from. His main targets were, aside from Zionism, British colonialism, the “moral turpitude” of Westerners, “infidels” who held all the economic power along with the wealthy, who he denounced for their selfishness and greed. He unforgivingly condemned socialism and communism as foreign doctrines that were incompatible with the message of the Prophet. He attracted admirers and supporters thanks to the many networks he controlled around the country and the social, athletic and charitable associations, as well as the free clinics and schools that he had built—thus overcoming the failures of the state while at the same time using them as a cover for plots and terrorist operations. Two years after our interview, government agents killed El-Banna as revenge for the assassination of Prime Minister Mahmoud Fahmy Nokrashy Pasha by a member of the Muslim Brotherhood. The political climate further deteriorated beginning in November 1947 when the United Nations General Assembly decreed the partition of Palestine into two states—one Jewish, the other Palestinian Arab. The decision would cause a surge in anger and mark the beginning of a Judeophobic campaign. The press, which until then had exercised restraint, began attacking Jews, accusing them of being both “Zionists” and “communists.” The creation of the State of Israel signaled the divorce between Jews and their compatriots around the Arab world. Zionist officials saw it as confirmation of their argument that non-Muslim minorities had no future in Islamic countries. Emigration to Israel surged once again. And yet my family like many others decided not to leave the country, still holding out hope for a return to normal. The government of King Farouk exploited the situation to discredit the Marxists, calling them “Zionists in disguise.” Beyond the Jewish background of many communist leaders, their decision to support the partition of Palestine made them highly suspect; they had thus implicitly endorsed the objective of the Zionist movement, whereas for years they had considered it “reactionary” and “racist.” In fact, Egyptian communists, like most of their comrades around the Arab world, supported the decision of the Soviet Union to vote in the United Nations General Assembly in favor of partition and thus the creation of a Jewish state. This blind conformity would cost them for years, despite remaining deeply hostile to Zionist ideology. The Jewish Anti-Zionist League, for example, was dissolved by Egyptian Authorities, its leaders arrested and its publications seized. An offshoot of a communist organization, the league also had defended the creation of a Jewish state. The reaction by authorities was even more brutal during the invasion of Israel by the Arab armies. On May 15, 1948, hundreds of supposed “communists,” and “Zionists” were held in two separate internment camps near Cairo. Many among the communist leadership, both foreigners and Egyptian citizens, were expelled from the country. They had more luck than their Iraqi counterparts, though, where three were hanged in Baghdad on the pretense that they supported the partition of Palestine. Eventually, I too was arrested, and subject to intense questioning about my political positions before being released on bail a month later while the pre-trial investigation continued. Given that martial law was in place, my imprisonment could have lasted indefinitely. Under threat of a double conviction for Zionism and communism, unemployed and without financial resources, I decided to leave Egypt. The police did not prevent my departure, but would only issue me an “exit without return” visa. Unwanted by my native land, deprived of my family, my friends and acquaintances, I left with two feelings: the sadness of emigrating and the joy at moving to France, the country so loved by my father. There a second life awaited me, one full of so many surprises. Several months later, on July 23, 1952, the “Free Officers” led by Gamal Abdel Nasser, seized power and one year after that, founded the republic. "I'm a refugee" – this is the title of a unique viral campaign launched by the Foreign Ministry on Tuesday calling on Israelis born in Arab countries to upload video testimonials telling the story of their deportation from those countries, Yedioth Ahronoth has reported. Initiated by Deputy Foreign Minister Danny Ayalon (pictured), himself a son of an Algeria-born refugee, the campaign aims to promote recognition and compensation for the refugees and their families and raise the issue on the international agenda. "Some 856,000 Arab Jews (sic) were expelled or left their homes penniless and arrived in Israel as refugees," Ayalon said. "Unfortunately, the story of their expulsion has never won recognition by the international community or any of the Israeli governments." "I call on every Jewish refugee from an Arab state to tell his or her story and help right the wrong," Ayalon said. The Foreign Ministry is calling on Arab Jews (sic) and their families to post video testimonials on a Facebook page which will be launched in Arabic, Hebrew and English. The Foreign Ministry – along with the World Jewish Congress and the Pensioners Affairs Ministry – is ramping up its campaign to bring the issue of Jewish refugee rights to public and diplomatic attention. 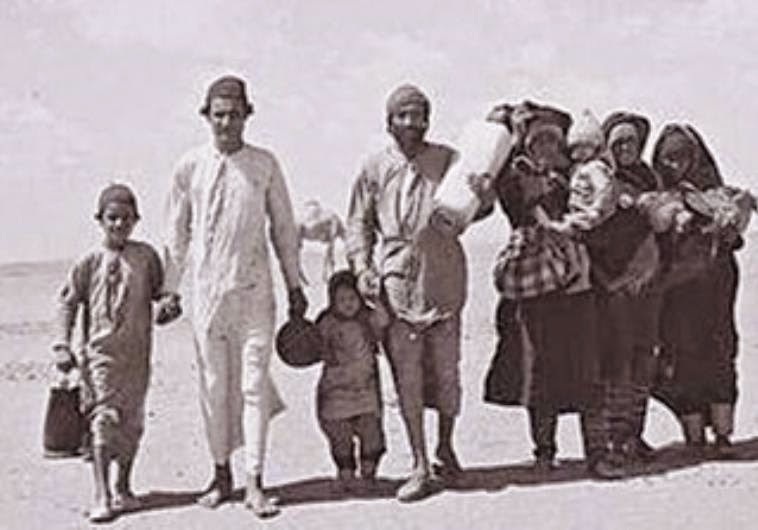 According to the Foreign Ministry more than 850,000 Jews from Arab states fled their countries of birth following persecution that ensued after the establishment of the State of Israel in 1948. Many also had their property confiscated. Speaking with The Jerusalem Post on Monday, Deputy Foreign Minister Danny Ayalon and Deputy Pensioners Affairs Minister Lea Nass said the government was currently finalizing plans to institute a national day of recognition for Jewish refugees from Arab countries. It is also planning to build a museum to document the historical events of these communities, as well as their cultural heritage; collate testimony from thousands of refugees; and bring the issue front and center on the diplomatic stage. Ayalon also pointed to legislation passed in the Knesset in 2010 obliging any government conducting peace negotiations with the Palestinians to include the issue of compensation for Jewish refugees as part of any final status talks. Ayalon denied that the campaign was designed to hinder the peace process, adding that even if that were the case Israel was already being accused of obstructionism. “They say we’re not ready for peace anyway, but this is not a reason not to do what is just and right for hundreds of thousands of people,” he said. Ayalon also insisted that Israel-Palestinian negotiations were the correct forum for advancing the rights of Jewish refugees from Arab countries, saying the linkage stemmed from historical precedents following wars on the Indian subcontinent and Europe. He added that part of the proposals made in the Arab Peace Initiative suggesting that an Israeli settlement with the Palestinians should bring peace and normalization with the entire Arab world, meant that the Jewish refugee issue should be dealt with in this comprehensive manner. The Pensioners Affairs Ministry, which was given responsibility for the issue in 2009, has taken the lead on the documentation of testimony from refugees and their descendants. Nass explained that it was critical to record the stories of the refugees, who, she said, had largely been forgotten. The ministry has digitized 20,000 documents pertaining to the Jewish refugees and will next week actively begin to collect further such documents and testimony, in coordination with various interest groups representing Jews from Arab countries. The project, named “I am a refugee” and having an initial budget of NIS 2 million, calls on refugees and their descendants to come forward and present their stories, documents, pictures and other records to create an archive similar to that in Yad Vashem for victims of the Holocaust. Dan Diker of the World Jewish Congress, Deputy foreign minister Danny Ayalon and Lea Nass of the Senior Citizens' ministry meet with the Jerusalem Post's editor Steve Linde (not pictured) to discuss the upcoming Jewish refugee conference on 9 and 10 September in Jerusalem. The excitement is mounting as a conference on Jewish refugees to be held in Jerusalem draws near. Arab states are panicking, imagining that the Jews are intending to claim back their property. We know that Israel’s Deputy Foreign Minister Danny Ayalon was planning to raise the Jewish refugee issue at the UN General Assembly on 21 September. Now The Algemeiner is reporting that he has been pushing for the UN to 'hold a summit' (actually a media event - ed) in September on the issue of Jewish refugees from Arab countries. The (Jerusalem) summit’s main goal would be to address the issue of Jewish property rights, according to a report in Yedioth Ahronoth. The Israel Ministry of Foreign Affairs states that between 1948 and 1951 about 850,000 Jews were expelled or forced out of Arab nations, losing an estimated $700 million in property ($6 billion today). 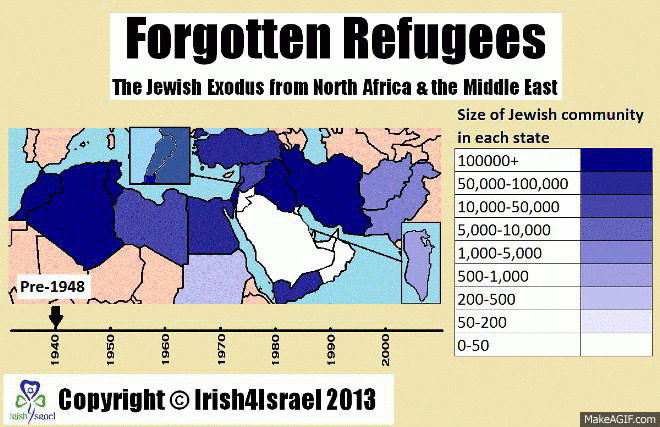 Most of these refugees were absorbed by Israel, where today they comprise over half the population. A number of Arab news outlets have misrepresented this development, particularly in Egypt and Algeria. Shayna Moh, 24, a Persian Jew who was born in the U.S., summed up succinctly what much of her community is feeling. "It feels weird," she said. "It's like my background versus my culture. I wouldn't like having to choose." But when it comes down to it, "Yes, of course I would support Israel," Moh said. "I'm Jewish. My religion is more important." Parisa Ooriel, 30, who came to the U.S. five years ago from Tehran to study at the New York Institute of Technology, said she was "definitely nervous" about the possibility of an attack and what would happen to her parents, who are still in Tehran. "I feel like I have roots there. I'm an Iranian Jew. I can't put one identity above the other. I feel pretty torn." The theme of being torn between a background, culture and religion is a painful rift that many Persian Jews are acutely feeling as Israel rattles its saber ever louder in Iran's direction. After the Iranian revolution in 1979 and the execution of one of the community's leaders, Habib Elghanian, who had been accused of spying for israel, the population of Iran's Jews dropped precipitously. The largest population of Persian Jews in the world now exists in Israel, with estimates between 200,000 and 250,000. As of July, there are an estimated fewer than 9,000 Jews still living in Iran, amid President Mahmoud Ahmadinejad's virulent, outspoken anti-Semitism. Now, with rumors of an attack before the U.S. election in November as Israel seeks to stop an Iranian nuclear development program that it fears would end up giving the Islamic regime an atomic bomb, stress may be reaching a boiling point. "I would absolutely be concerned for my family," said Shayan Sadri, 26, of the possibility of an attack. Sadri was born in Houston, but his parents emigrated from Tehran. "I don't want to support Iran and their nuclear plans or Israel and their war plans. I want to be neutral." "I would support Israel," said Ben Samih, 24, who studied political science at Queens College in New York. He came to the U.S. when he was four and is "basically American" but says most of his mother's family is still in Iran. "There's a lot of people [in the community] who are saying, 'Let's bomb them, let's bomb them, let's do it,' but it's a tough situation." Opinions are just as mixed and feelings are just as torn in Great Neck, on New York's Long Island, one of the centers of the Persian Jewish community. Around 45,000 families live in the Great Neck area, and about one-third of them are estimated to be Persian Jews. Of the 14 synagogues in the town, six are Sephardic, a term that refers to Jews from North Africa, the Mideast and the Mediterranean. And at the Shop Delight Supermarket on Welwyn Road, nearly all customers stop by the bread counter to pick up traditional Persian flatbread, baked in an oven that has been specially imported from Iran. Eddie Yakubov, 36, Shop Delight's owner, said Israel had an obligation to attack. "Israel has to go in," he said. "If it doesn't, it's going to be a bigger problem." And as for Persian Jews in Great Neck, well, "They are Jewish," Yakubov said. "They want Israel to succeed and to win. They are concerned about what will happen to Israel if Iran gets the bomb." Eddie Aziz, 29, agreed and said that an attack on Iran "feels necessary." "Iran is a threat to Israel," he said, adding that he's a longtime member of AIPAC, a U.S.-based pro-Israel lobby, so he's "more aware of what's going on than what's in the news." Aziz wouldn't elaborate. State Assemblywoman Michelle Schimel, who represents Assembly District 16 which includes Great Neck and much of the Persian Jewish community, said that many of her constituents were concerned about what might happen to the Jewish population that's still in Iran if a war were to break out. "Many of them still have family living there," Schimel said. "When I ask them what they think Israel should do, they're usually not commital, but they support Israel wholeheartedly." Schimel also that the Iran Divestment Act, which was passed in Albany earlier this year, has been praised by much of the Persian Jewish community. The act punishes any companies who do business with Iran by preventing them from also doing business in New York state. "What we're doing on a small level is finally taking hold," said Schimel about the Act. "The fiscal impact is starting to work, and when I speak to Iranians in my community, they agree and they are glad that companies who are investing in Iran are being prevented from doing business in the U.S.
"People don't want conflict," Schimel said, "Nobody wants war. And this war would definitely impact well beyond Israel and Iran. I feel that we should do economics first." The head of the Persian Cultural Organization, who didn't want his name used, also said the community, as a rule, was against a war between Israel and Iran. "Overall, the feeling in the community is that they don't think there should be a war," he said, "Mainly because there is still a Jewish community in Iran. The Jewish community has been there for 3,000 years. It's still the biggest Jewish community in the world outside of Israel and the US. They have parents, uncles, aunts, sisters, brothers, grandparents, in Iran. Even though they support the fact that someone has to get rid of the government, they don't want it this way [with war]. The way that America is doing it and the UN is doing it, that's the best way to do this." But, if push came to shove, he agreed, then the community would probably stand behind Israel. "If one day there's war," he said, "The affiliation with Israel is much stronger than with Iran, because of the fact that they all left Iran." Fariba, 52, a member of the Mashadi congregation in Great Neck who wouldn't give her last name, said, "I would not be happy, but if it has to be done, it has to be done." Fariba said she came to the U.S. in 1983 from Tehran and that "the Iranian people themselves are not bad; it's just the politicians. I would be upset both for the Israelis and the Iranians. But if Ahmadinejad has to be stopped, he has to be stopped." Lida Ayalah, 45, who came to the U.S. less than three years ago, lived in Israel for a short time after leaving Iran. "I felt better in Israel," she said, in her soft Farsi-tinted English. "All of my family is still there. I was very alone in Iran. It's very dangerous for the Jews in Iran." "I think Israel should attack Iran," Ayalah added. "Ahmadinejad wants to use atomic weapons. It's dangerous for Israel. It's better to support Israel, and the community thinks like me." "I'm scared and I'm worried for the Jewish people," said Rachel S., 66, who didn't want to give her last name either. "It's very scary for the Jews in Iran." In between the aisles of vegetables at Shop Delight, Rachel reminisced about her life in Iran. "I had a beautiful car, a beautiful job, everything, but we decided it was better to leave." She and her four children escaped on horseback 27 years ago. She hasn't been back since and says her cousins who still live there are afraid even to speak on the telephone. "I came here with one suitcase, four children and one Torah," Rachel said. "I am Iranian, but first I am Jewish, and I am proud I am Jewish. I have everything here [in the U.S.]." 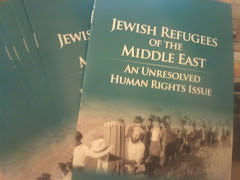 In this rather long and wide-ranging Times of Israel blogpost, Dov Ivry has some very interesting things to say about the Jewish refugee problem and how it should be solved. He reminds us that the pro-Nazi Mufti of Jerusalem conceived a final solution for Jews in Arab lands. Appeasement of Arab claims will only bring forth the 'Fourth Reich'. The whole question of refugees falls under Resolution 242 of the United Nation which states that the sides will resolve the refugee problem: both Jewish and Arab refugees. With Oslo the refugee issue was put on the table. That means any claims from Arabs, who are seeking lost property, have to be dealt within the framework of the settlement on the refugee issue. That’s the answer to the second part of this. Of course as with everything else no progress has been made on the refugee issue and the fault lies entirely with the Arabs. There were 850,000 Jews stripped of everything run out of 10 Arab countries. Arabs who fled the fighting in Israel numbered upwards of 500,000. The Jews lost billions in property; some say $100 billion in today’s money — $21 billion alone in one neighborhood of Cairo. The Arab losses would not come to half of that. Israel, with very little resources, took care of its own. The Arabs, with money to burn from oil, put its refugees on the dole and the let UN take care of them on other people’s money. That’s old news. The problem is this. Never in history since the dawn of time has a refugee been able to pass his status to the next generation. What normally happens is that a person moves from point A to point B where offspring is born. The offspring belongs to the state at point B; what status they give him has got nothing with the original state at point A. Some countries permit expats to pass on their citizenship to their children; some don’t. But refugees? What the Palestinians have done is tried, and this is also a con, to pass refugee status down to the third and fourth generations. Now they are claiming some crazy figure of 5 million refugees and want Israel to accept them all under a “law of return.” That foolishness even more than the status of Jerusalem apparently was the straw that broke the back at the Camp David talks. There are two ways to resolve the refugee problem. 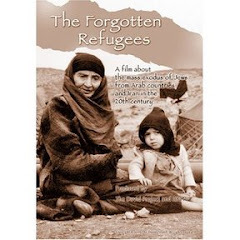 If they have 5 million refugees, then our side must have 7 million refugees by their definition – that would be probably include most of the Sephardi and Yemenite Jews in the world save those who were domiciled in Europe or elsewhere when the expulsions occurred. Israel is not going to allow 5 million people to swarm into its land nor would Russia or Argentina or anyone else so there has to be a financial settlement. Since the difference in value in property is $50 billion, according to some estimates, let the Arabs pay up and we’ll call the refugee problem fixed. The other way to solve this is probably what is going to happen. Even those who were babies among the actual genuine refugees are in their mid 60s today so in another 10 or 20 years there just won’t be any refugees. Time will inter the problem. Or as Clinton once suggested, come up with a fund. If it is limited to actual refugees, it would be a good idea. But if the Arabs want to be crazy then Israel has the right to charge interest on that $50 billion owned to the 7 million Jewish refugees, because once the Oslo talks started that constituted an admission by the Arabs that as per Resolution 242 there was a Jewish refugee problem and they were obliged to address it. Had they plunked down $50 billion the same day that would have been the end of it. But meanwhile that money is being used to bottle Coca-Cola in Egypt, growing crops, and for investments; it is not standing idle. They have to pay interest. In another few years they will owe us $100 billion and it will grow down through the ages. 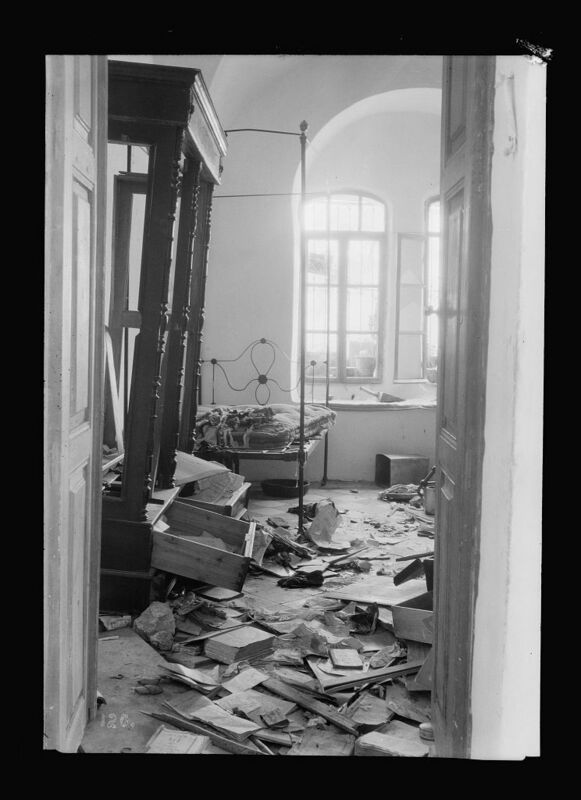 Wrecked synagogues and Jewish homes, stained with the blood of 67 Jews. Such was the scene on this day in 1929 when a mob rampaged through the ancient Jewish community of Hebron. 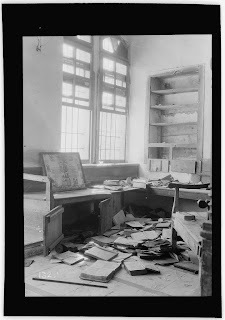 Here are some rarely-seen photos of the destruction from the Picture-a-day American Colony collection. The leaders of the Hebron Jewish community have admitted not having seen them before. 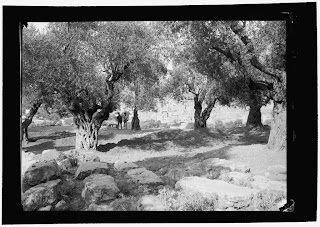 Starting on Friday, August 23, 1929 and lasting for a week, attacks by enraged Arab mobs were launched against Jews in the Old City in Jerusalem, in Jerusalem suburbs Sanhedria, Motza, Bayit Vegan, Ramat Rachel, in outlying Jewish communities, and in the Galilee town of Tzfat.Small Jewish communities in Gaza, Ramla, Jenin, and Nablus had to be abandoned. The attack in Hebron became a frenzied pogrom with the Arab mob stabbing, axing, decapitating and disemboweling 67 men, women and children. At least 133 Jews were killed across Palestine. In 1931, there was a short-lived attempt to reestablish the Jewish community in Hebron, but within a few years it was abandoned until the Israel Defense Forces recaptured Hebron in 1967. A moving plea in the Jerusalem Post by Michelle Huberman of Harif, herself the mother of a Down's syndrome child, for the release of Rimsha, a mentally-disabled Pakistani Christian 11-year-old accused of blasphemy against Islam. When I received an e-mail that a little girl with Down's syndrome was arrested and jailed in Pakistan, my stomach felt like it had been kicked. Rimsha is from the Christian village of Maherabad in Islamabad. She was severely beaten by local Muslims before being arrested. She is reported to be in very bad shape and has bruises on her face and hands. Other Christians and their homes were attacked and an ultimatum issued by the Mullahs for Christians to leave the area. More than 600 Christians have now fled. BBC report here. Rimsha was allegedly throwing away rubbish that included burned Islamic religious texts. Whether this is true or not is beside the point. The question is how could the local Imam incite his Muslims followers to beat up a special-needs child and threaten to set her on fire? How could the Pakistani police have torn this traumatised child away from her family and thrown her into a rat-infested adult prison? Why are none of the world's ambassadors demanding her instant release? Where are the cardinals and the archbishops? Is blasphemy in Sharia law really too hot for anybody to handle? We see a lot of angry Muslims on the streets of our cities. When are we going to see them march and say "not in our name" to these atrocities? Since I heard this news I have had nightmares visualising this innocent little girl separated from her family. I have a child with Down's syndrome and know how special and sensitive our children are. Not an ounce of malice in them. When you have a child with a disability, you become part of the worldwide family of parents whose child has that condition. I can be visiting another country, and if I see a child with Down’s syndrome at another table I am compelled to go and talk to their parents. Even if I don't speak the language. Likewise, people from abroad approach me and my beautiful daughter on the streets of London to tell me they have a special Down's child in their family. So now Rimsha is part of my family. I cannot begin to imagine what her parents must be going through. Wednesday night, along with the British Pakistani Christian association, I went to a demonstration outside the Pakistani High Commission in Knightsbridge, London. From the microphone I appealed for this child to be released back to the bosom of her family. My daughter and her friends with special needs came along too. They wrote cards and brought their own toys for this little girl - to comfort her in her dark moments in the prison. We left them on the steps of the building. The cruelty to Rimsha continues with the prison inspectors refusing to meet with her lawyers. Tahir Naveed Chaudhry, one of Rimsha's lawyers, said "I myself contacted the inspector general (of prisons) by phone and he told me that he will call me back, but I am still waiting to speak to him." Christian activist Xavier William, who had visited Rimsha at the police station where she was first detained, said she was "frightened and traumatised." More here. I represent Harif, an organising representing Jews from the Middle East and North Africa. We know the meaning of bigotry and ethnic cleansing. We Jews were among its first victims in the Arab and Muslim world. We were branded criminals, just because we were Jews. Now it’s the turn of the Christians. When the Christian Copts were being killed this year on the streets of Cairo, Levana Zamir, a Jew born in Cairo, told me "that's what they did to us when we lived there. Thank G-d there was a State of Israel in 1950 where we could flee to". Sharia law is criminalising Christians just for being Christians. If you are mentally handicapped or not, it makes no difference. The law makes no allowances. It simply will not tolerate the Other. Please write to the Pakistani authorities and your politicians and demand her immediate release. What made Jewish existence in Aleppo so unique and vibrant? For thousands of years, Aleppo was an unofficial capital of the Sephardic Jewish world. Fueled by wealth from international trade and waves of Jewish immigration, the city’s Jews sustained a pious community revered for educational excellence and as a guardian of traditions with roots in ancient Israel. Aleppine folklore—some even say that one of Kind David’s generals personally laid the foundation for its great synagogue, now located at the heart of fighting—hints at the prestige of the city in Jewish history. But the city is lost, and Jewish existence has been all but erased from its cobbled streets. Remarkably, what has not disappeared is the Aleppine way of life in diaspora communities spanning the globe. “I would say without any hesitation that the [community of Jews from Aleppo] is the strongest Jewish community in the world in the sense of solidarity,” Yom Tov Assis, a professor of medieval history at the Hebrew University in Jerusalem, told me in his book-saturated office. Assis was born in Aleppo and briefly experienced the violence in the city that accompanied Israel’s independence. He recently founded the center for the study of Aleppine Jewry at the Hebrew University in an effort to preserve and study the traditions of his vibrant community. “There is hardly any Jewish community apart from the Haredim, the ultra-Orthodox, that is so strongly attached to its past and traditions,” he said. Outside of Israel, few cities in the Middle East have a richer history of Jewish cultural activity, education, and trade than Aleppo. Legend has it that the city, which is referred to as Haleb in both Hebrew and Arabic, derives its name from a story of Abraham guiding a flock of sheep through the fleecy shrubbery of the surrounding mountains. He is said to have distributed his sheep’s milk (halev in Hebrew) to the local residents of the city, nestled in Northern Syria’s rolling hills, which thereby was known as Haleb. Historically, Aleppo found itself at the crossroads of two of Jewish history’s major developments: the expulsion of Jews from Spain and the rise of the Zionist movement. As refugees from Iberia flooded the Eastern Mediterranean in the early part of the 16th century, Aleppo became one of the most important centers of absorption. When Aleppo fell under Ottoman rule in the 16th century, the Caliphate maintained a relatively warm relationship with the Jewish community. Provisions ensuring that synagogues were not built taller than mosques and that Jewish religious behavior was performed quietly—part of their status as Dhimmis—meant that Jews found a fragile entente. They were not alone. Some Jews do remain in Muslim countries, from Morocco to Iran. Their numbers, however, are too small to legitimatize (sic) the notion that outside of Israel there are still vibrant Jewish communities in the Middle East. What, then, is the best way to remember Jewish life under Muslim rule in the Middle East? It’s a question that has floated through the halls of Jewish academia for at least 30 years, alternately provoking idealized versions of peaceful life in the Arab world and dramatic tales of persecution. Especially among those dedicated to European Jewish history, which still struggles to understand the tragedy that befell European Jewry in the 20th century, there is a tendency to view life under Muslim rule as exceedingly peaceful, marked by co-existence and even mutual respect. Outside of academia, the question tends to adopt political contours, with people seeking to place blame either on the Zionist movement or the Arab populations that expelled their ancient Jewish communities after the creation of the state of Israel. Whichever side one falls on politically, it is clear that, for Jews, Aleppo was lost in 1948. The recent destruction of the city’s ancient monuments is merely a reminder of what had already been lost. While the Aleppine community in Israel is not nearly as numerous or powerful as their brethren in Brooklyn—the largest Aleppine Jewish community in the world, covered widely for their financial success and excess—their proximity to Syria and relationship with Jews from other Arab countries give the events in their lost city a more immediate feel. Aleppine synagogues, especially in Israel, have tried hard to protect the unique aspects of their religious observance. On winter Shabbat mornings, tucked deep in the serene streets of Jerusalem’s Nahlot (sic) neighborhood, Syrian Jews sing Bakashot, Kabbalistic poetry originating in Spain. 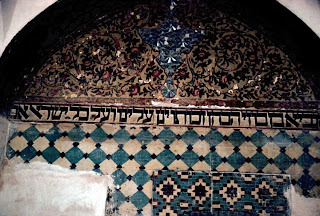 The Great Synagogue of the Aleppo Jewish community in Jerusalem, established in 1901, maintains these and other traditions, such as liturgical singing heavily influenced by Arabic (meaning what? - ed), known as the Sephardi Hazanut. It was a summer of passionate demonstrations, with protesters calling on the government to provide social justice and lower the cost of living; the year was not 2011 but 1971, and the protest leaders were not middle-class Ashkenazi Jews, but underprivileged Mizrahi Jews going by the name the Black Panthers. The Black Panthers movement was born out of anger regarding disparities between Ashkenazi and Mizrahi Jews, and widespread discrimination by authorities. The protests began in January, 1971, in Jerusalem's Musrara area, a poor, crime- and drug-infested neighborhood. Young Israelis of Mizrahi descent, protested outside the Knesset building in Jerusalem, against a lack of educational and employment opportunities, and poor, crowded housing conditions. Most of the Mizrahim immigrated to Israel during the 1950s and 1960s, fleeing hostility in Arab countries. They endured tough conditions in transit camps and development towns, and blamed the Labor-led government, dominated by Ashkenazi Jews, for the difficult conditions in which they lived. On August 23, 1971, tensions mounted between the Black Panthers movement and the Israel Police, as officers violently dispersed a protest in Jerusalem, injuring 7 and arresting 23. The movement's name was inspired by the African American Black Panthers, after one of the Israeli movement's founders, Saadia Marciano, met with Angela Davis, from the African American Black Panthers revolutionary leftist organization. Gabbai is confident he has had a positive impact in toning down his interlocutor’s initial hostility toward, and misunderstanding of, Judaism. Similar exchanges with other Arabic speakers have led to additional questions and more extensive online conversations. “There is a thirst for information, knowledge about Jews,” says Gabbai. An Arab journalist who writes for one of Yemen’s top papers wrote to Gabbai about a neglected Jewish graveyard in Aden. 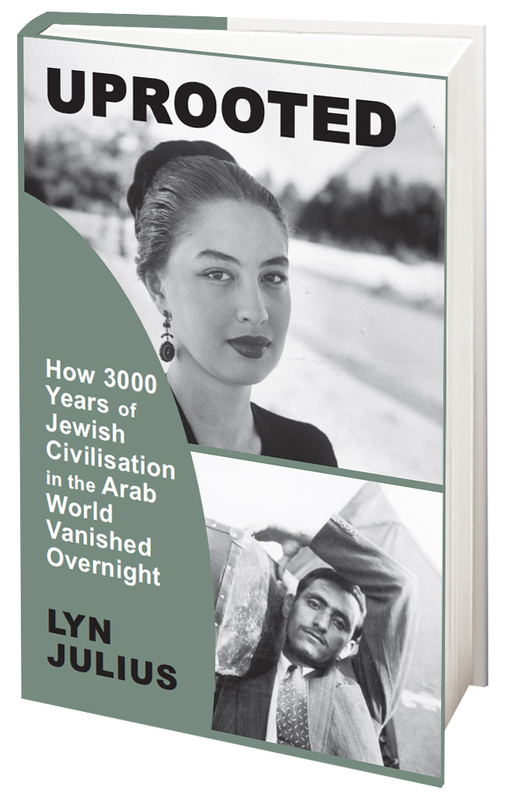 They corresponded frequently, discussing, among other topics, the rich history of what was once the largest Jewish community in the Arab world. The nexus is Asl al-Yahud (Origins of the Jews), an Arabic- language website Gabbai created under the auspices of the American Jewish Committee four years ago. Asl al-Yahud – www.aslalyahud.com – is a growing resource in print, photographs and video about Judaism, and the history of Jewish communities in Arab countries. “The website is advancing understanding of Judaism for Arabic speakers,” says Gabbai. He single-handedly manages the site’s content, and also runs a related Facebook page, in Arabic, where much of the conversation occurs. Gabbai is passionate about maintaining the culture and traditions of Jews from Arab countries. His parents are active members of the aging Iraqi Jewish community in Israel. His mother’s family came from Iraq, and his father was one of the last Jews to leave Egypt. Gabbai was born in Israel, and after growing up in New York and New Jersey, he attended Yeshiva University. The Arabic website project is a synergy of Gabbai’s personal mission and AJC’s pioneering inter-religious work, addressing one of the greatest interfaith challenges of the 21st century – Jewish-Muslim relations. Asl al-Yahud is purposely apolitical. It does not take on the contentious, divisive political issues that dominate discourse about the region, nor does it offer specific guidance on advancing Muslim-Jewish relations. But recalling the historical interactions of Jews and Muslims over the centuries is a key to deepening understanding of Judaism among Arabs across the Middle East. Gabbai believes it is important to explain Judaism through the use of Arabic-language sources and the teachings of renowned Jews who lived in Arab lands. He excerpts on Asl al-Yahud the works of Sa’adya ben Joseph al-Fayyumi, the 10th century Egyptian-Baghdadian scholar who translated the Hebrew Bible into Arabic, Maimonides, and other legendary rabbinical scholars and thinkers. “We are explaining Judaism from a Middle East vantage point,” says Gabbai. Online conversations with inquisitive Arabs – whom he is unlikely ever to meet in person – occupy some of Gabbai’s time most working days, but he finds each encounter intriguing and energizing. During the Islamic Holy Month of Ramadan, visitors from Egypt and Saudi Arabia accounted for some 36 percent of the web traffic. “Saudis tend to have more informed questions,” says Gabbai. Some Saudis access the site to check on what they are taught in their own schools in the kingdom. 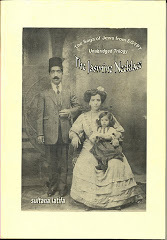 The Arabic website offers detailed historical information on lost or extant Jewish communities in Iraq, Kurdistan and Saudi Arabia, and soon will include sections on Algeria, Egypt, Libya, Morocco, Tunisia and Yemen. “Videos are vitally important to conveying the story and explaining Jewish rituals and religion,” says Gabbai. Before Passover, he made a short film with Arabic narration on making matzo. A Yemeni Jewish woman described the ingredients and process as she produced the unleavened bread. The famed Ben-Ezra synagogue, home of the Cairo Geniza, was featured in an informational video on the design and rituals of synagogues in the Arab world. 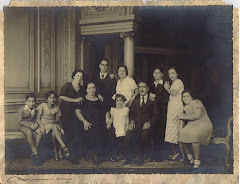 Harif (the Association of Jews form the Middle East and North Africa) are collecting community photos for the exhibition 'Celebrating the Sephardi Community in London'. We are joining the established Klezmer in the Park event on 9th September to bring a 'Sephardi Twist' to Regents Park. We are also busy creating a beautiful henna tent from a mix of exotic fabrics so that visitors can experience the ceremony. Some of the events I've seen are in the homes of the bride's family and others in lavish hotel settings. The pictures show the bride and her family dressed in traditional brocaded kaftans, often passed down from mother to daughter, heavily bejewelled and tables laden with platters of sweets, sugared almonds and candles as the centre piece. Some ceremonies are women only whilst others are mixed, with the men being exotically dressed in embroidered djebellas and tarbush (fez) hats. At the Moroccan wedding hennas I’ve attended the couple change into traditional costumes during the evening and being carried on amariya thrones above the crowd, with the guests giving a blast of ululations to the happy couple. The bride’smother then sets up home in the exotic tent and applies henna paste to the hands of the guests to bring luck and mark the occasion. The stain stays on the palm of your hands for at least five days, and is a symbol to your friends and work colleagues that you've attended a recent simcha. Although not all communities like their hands being stained. Iraqi Jews wrap the henna in foil balls and wear them on their fingertips. Ashkenazi bride Carol Shelamy (née Elman), who has been married for 30 years to her Adeni husband Eitan, told me that all those years ago she wore gloves for the ceremony so as not to stain her hands. After the establishment of the State of Israel in 1948, many people were made to feel ashamed of having 'primitive' hennas in Israel. It was not until the late 70's that previously neglected cultural celebrations began to experience a revival. "Arabness" was discouraged in the newly founded State as it tried to carve out a new Jewish identity. But in the last few years, along with the Mimouna festival and the popularity of Mizrahi music, it's now entering mainstream Israeli culture. Noting how many Moroccan homeware shops have cropped up in Tel-Aviv on my recent visit, the owner of one told me that people were buying all the trimmings for henna ceremonies. "Even the Russians are having them now," she explained. As Noam Sienna of Henna by Sienna recounts: "Today, the revived henna ceremony is very different than its historical predecessors. One of the main changes to the henna ceremony has been in its length and timing. 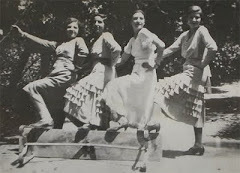 While in the Diaspora, the pre-wedding festivities often lasted a week or more, in Israel they were severely compressed due to constraints of money and time. The application of henna to the bride, whether done over a period of three days, as in Yemen, or whether done multiple times over a two-week period, as in Morocco, was reduced to a single evening. The timing of the henna ceremony was moved from the night before the wedding, or a few days before the wedding, to the week before the wedding or even earlier. Furthermore, where formerly the groom may have been henna-ed in a separate ceremony in a separate location, in Israel the two ceremonies were joined, so that the groom sits next to the bride and is henna-ed with her." Come and see for yourselves as we at Harif hope to create the ambiance of the henna in central London whilst the bandstand plays a mixture of live Klezmer music mixed with Sephardi bands. After winning a battle with a Saudi Prince for custody of their daughter, a French-Jewish woman, Candice Cohen Ahnine, has fallen to her death from her fourth floor Paris apartment in mysterious circumstances. Was it an accident or a murder? Le Parisien reports that questions surround the death of Candice Cohen Ahnine, 35. For four years she had engaged in a custody battle for her daughter, 11, kidnapped by the child's father, Prince Sattam of the royal house of Saud. On the day Candice died it seems that the young woman was trying to escape 'something dangerous' by climbing on to the balcony next door. Her relatives report that she felt 'threatened' recently. An autopsy will be carried out next week and her neighbours interviewed. Her lawyer is said to be devastated by news of Candice Cohen Ahnine's death. Suicide seems unlikely: her mood was upbeat and elated as she planned her trip to Saudi Arabia in hopes of being reunited with her daughter. Point of No Return readers will be fascinated by the Jewish angle to this story. Apart from the fact that Candice's origins are North African Sephardi, it is not known what her family thought of their daughter's love entanglement with a Saudi prince. In this video interview recorded in February 2012 (in French), Candice, who wrote a book called 'Rendez-moi ma fille', smiles as she recalls falling in love with the prince, whom she met in a London nightclub. "We were the same age, two spoilt kids," she remembers. Then things turned sour: she talks of her imprisonment in Prince Sattam's palace in Riyadh for months on end. On one occasion a female member of the household insulted her, calling her a dirty Jew. She tells how the prince's family tried to get her to sign her death warrant - stating that she was a Muslim who had converted to Judaism. Apostasy is a crime punishable by death. She did not agree to sign. They are only asymmetrical in the following way: One group of refugees has been resettled and is now made up of full-fledged citizens of Israel and the West. The other group is, uniquely among the world’s refugees, still festering 60 years later in camps (although these are now more like small towns). Its members depend on the UN agency UNWRA for support and, except in Jordan, are deprived of civil rights and the right to own property and to do certain jobs. That is exactly why Jewish and Arab refugees should be compared: In the former case, Jews were absorbed, resettled and built new lives, making a vital contribution to Israeli culture and society. In the second case the Palestinian refugees were allowed by the UN to pass on their refugee status in perpetuity, to the extent that the number of “refugees” has ballooned from about 700,000 to five million, very few of whom were born in Palestine. Not only does the existence of these Palestinians in a perpetual refugee limbo create an obstacle to peace, but to leave them in that state seems both supremely unnatural and an obscene abuse of their human rights for political purposes. In that sense, the resettlement of the Jewish refugees is an object lesson to the Arab side. It’s true that for years Israel treated Jews coming to Israel as Zionist immigrants, not refugees. But there is no denying that the majority of Jews would never have come in such numbers to Israel — where initially they faced harsh conditions in desert tent camps called “maabarot,” insufficient food and inadequate sanitation — unless they felt they had no choice but to leave their countries of birth. It is somewhat cheeky of Ran Cohen to say that he came at the behest of Zionism, when he arrived as a 13-year-old refugee with his family on the Ezra and Nehemiah airlift from Iraq. Of course, one can be both a refugee and a Zionist, but virtually the entire Jewish community of Iraq was expelled from a homeland they had lived in for 2,600 years. Their assets were frozen and they were allowed to take a handful of cash, only three summer and three winter suits, one pair of shoes, a blanket, six pairs of underwear, socks and sheets, one wedding ring, a wristwatch and a thin bracelet. As the victims of a brutal uprooting and dispossession, Jewish refugees are entitled to justice under human rights law, no matter how much time has elapsed since the injustice was committed. But Savren turns the Israeli government’s longstanding argument against itself: the Jews can’t be refugees because they were “coming home.” There are many flaws with this argument. First of all, 200,000 Jews from Arab countries did not go to Israel. 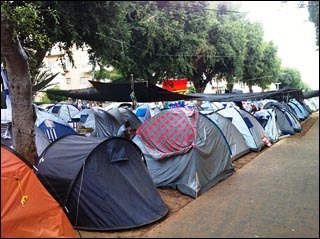 Do Jews who are now French or Brazilian citizens feel any less “at home” in their new countries than Jews in Israel? Savren’s assumption is that Palestinian aspirations to “come home” remain unfulfilled. The Palestinians could make Arab states “home” if there was a will. At the very least, a future Palestinian state in the West Bank and Gaza would be expected to welcome Palestinian refugees home and give them full civil rights, although pronouncements by the Palestinian ambassador to Lebanon do not bode well on this score. Objectively, Palestinian Arabs ought to be easily integrated in host countries where people speak the same language, share the same culture and religion, and where their children were born. And now comes the kicker: Savren states that Jewish and Arab refugees are not alike because “Palestinian Arab society was ripped asunder” during Israel’s War of Independence. So the Jewish communities of the Arab world — with their traditions, culture, cemeteries, and shrines; their synagogues, schools, and communal structure — were not ripped asunder, with families scattered to the four corners of the earth? If anything, the current campaign demanding equivalence between the two sets of refugees does a disservice to the uprooted Jews. We are talking about the massive ethnic cleansing of age-old communities. Apart from enduring dispossession, humiliation, arrest, torture and murder, the Jews lost their entire civilization, their Judeo-Arabic language and much of their culture. Their displacement was on a larger scale than the Palestinian one, and their material losses greater. Whereas Arab refugees fled a war situation of their own making, the Jews were victims of unpredictable violence and a deliberate policy scapegoating them for being Jews. The proof is in the pudding: A million Arabs live in Israel today, whereas only 4,000 Jews from a 1948 population of one million live in Arab countries. But this is no reason for well-meaning but fundamentally ill-informed commentators to privilege Palestinian rights, while despising the rights of Jewish refugees and their Sephardi and Mizrahi descendants, who make up 50 percent of Israel’s population. There’s a word for that: racism. Horrified, Judy Feld Carr closely follows the news coming out of Syria, where government troops and rebels are waging a bloody civil war. The former music teacher from Toronto has never been to Syria, yet she has a special connection to the country, and especially to the Jewish community that used to live there. For nearly three decades, Feld Carr single-handedly arranged the smuggling of more than 3,000 Jews out of Damascus, Aleppo and Qamishli to safety in Israel and America. 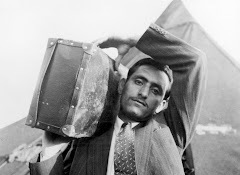 At the time, the totalitarian Syrian regime didn’t allow Jews to emigrate and tortured those caught trying to escape. But lower officials, she found out, could be bribed into letting Jews leave. While the civil war, which started in March 2011, has reportedly already claimed more than 20,000 lives, Feld Carr is especially disgusted by reports of gratuitous savagery, such as when rebels cut off a Syrian soldier’s head with a knife — because she says she knows pretty well the kind of cruelty Syrian troops are capable of. The unlikely saga of a protracted covert rescue operation led by an Ashkenazi musicologist who grew up in Sudbury, northern Canada, began when she and her late husband first learned about the plight of Syrian Jewry. The issue wasn’t very much in vogue in the early-to-mid-1970s, as most Jewish activists were focused on demanding freedom for their brethren in the Soviet Union. After an initial phone calls to a synagogue in Damascus, she and her late husband started sending packages with religious items to the local Jewish communities. After a while, she started communicating via these packages, hiding coded messages in them. Two years later, Feld Carr managed to smuggle the first person out of Syria. “It was a straight ransom but it took me ages to do it.” At the time, Canada didn’t have an embassy in Damascus and it was quite an ordeal to bribe the officials to get the refugee the papers he needed to exit the country and board a plane to Toronto, she recalled. The Syrian Jew arrived in Canada in terrible shape: Because his children had been caught trying to flee, he spent some time in a Syrian prison, where he was badly beaten. On top of that, he was suffering from terminal cancer. “After we brought him to Mt. Sinai Hospital, he said to me: ‘Judy, I have one thing to ask you: I want to go to Israel. I want to have a cup of coffee with my mother, who’s 97 years old. Then I can die in Israel,’” Feld Carr remembers. “Remember: I don’t know yet what I’m really doing. I thought to myself, what do I say to a man who’s dying? So I said, yes rabbi, I will take her out.” Feld Carr succeeded in smuggling the 19-year-old out of the country. Today she is a grandmother and lives in Bat Yam.